The strengths of a good goalkeeper stand in their basic skills; ironing out the basics of the goalkeeper’s task first will help you in the long run. With easy goals not encouraged, the ‘no goals’ rules can be a useful reminder of how not to get scored on! When it comes to goalkeeping, there are a few basic rules when it comes to potentially allowing the goals you do. Not necessarily ones based on technique or style of play, they are focused more on how the goalkeeper allows goals; whether they give away easy goals or if they play as hard to beat. By following these simple and seemingly obvious rules of playing in goal, you can improve your play and challenge shooters to really step up their game to earn their points against you (that is if you give up any goals!). Any goal going in against you that breaks the rules laid out, means you aren’t forcing the shooter to beat you. They don’t have to work hard for their goal, as you allow a ‘softie’! All that is happening is you are forcing the shooter to merely put the ball ‘on’ the goal rather than pick a spot that you would be difficult to beat against. A lack of time as the shooter gets a defender coming in to oppose them, is going to make their mind up for them as they simply shoot towards the goal, rather than targeting a specific spot to beat you at. Rather, a shooter ‘working’ the goalkeeper will look to exploit the corners or spots difficult to reach, trying to get around the barrier that is the body in front of them as they shoot. And this is what the goalkeeper wants, to be tested and consequently test their shot stopping abilities! The first rule and most obvious one, is to not concede through you. Not letting a goal go through you and humiliate you is quite important to showing you can get the job down against weaker, less challenging shots. 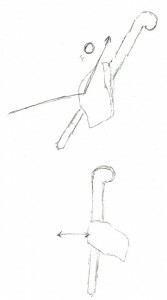 This can be straight through the legs where you struggle to close your legs in time, possibly against a corner or strike from the top of the D, or possibly gaps in your stance, like the holes under your shoulders, with space between gloves and body, against a tip-in for example. This is the same for ice hockey, where goalies are taught to close gaps as they go down to block and play the percentages. In football they really do focus on the adage of never allowing a shot to get through you, teaching the need to get your body behind a shot so that you get as much coverage as possible if you fail on the initial block (wherein they teach technique to bring the chest in to play to help out, as they go to catch a low ball for example). Again, just like there should be no goals through you, you should aim to not allow goals squeezed under or over you. Essentially, even though you should work hard not to allow them, shots into the corners are ones that if there are any, are the least embarrassing. Lobbed shots, when you are off your line and beaten by a chipped ball aren’t as regular in hockey as they are in football, but should not be given away so easily against the opposition. And balls squeaking through underneath a kicker not firmly placed on the pitch, or when ‘logging’ against a shot or sliding out to block, should be avoided at all costs. Technique and balancing saves should prevent such occurrences. Just as you should not allow goals through you as a result of poor footwork or a not very efficient ready stance, you should not be giving away easy goals as a result of weak fundamental angle play. Making sure you are on the angle and covering space is essential to any save, but conceding through a poor angle is not great! Allowing a goal inside the gap between you and your near post is considered another no-no. 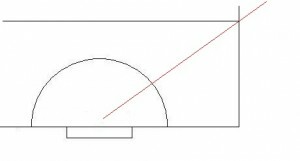 A goal where you concede through the acute angle on year near side is not what you want; if anything, you should be conceding on the other side where you have more work to do to cover more space, rather than your near post which you should be covering properly. A goal allowed on the ‘short side’, like the other goals, is more unforgivable because it shows problems with your fundamentals. Work on your angles and making sure you have them covered, in training and then in games. Ultimately, it’s a good idea to put these rules to work in your own game. Whilst it’s fun to think about conceding in a different light and making light of goals allowed, these ‘rules’ draw attention to how you should play and what goals you should not be giving up, even if you can make those breath taking stops. Try and focus on them game in game out, so that you give your full attention to being the best shot stopper you are capable of. At the end of the day, make the shooter make the difficult shot, not the easy one! When setting for the save, you need to be watching the ball. True eye contact allows you to focus on the ball and react accordingly to make the appropriate blocking action. Obviously this is not always possible in every situation, like tips and deflections where you see the ball at the last minute, but on point shots and at short corners, you should maintain a strong focus on the ball. By being pro-active and alert, you are in a better position to make the save; so whenever you make a save, or kick clear, you should always set your focus on the ball and maintain it throughout the save process, so as to maximise your efficiency. When watching the shot, you should focus on the ball from the ball carrier or shot all the way into the save. The way you watch the ball goes back to the fundamental skill of reading the game; not over committing and reacting to what happens in front of you. When the potential shooter becomes obvious, you can then focus on the ball’s positioning, setting up on the angle and in your stance ready to make the save. Watch the path of their hit or flick; watching the ball from the stick all the way into your equipment; putting a strong emphasis on focusing on the ball from release to reaction. Self discipline is the order of the day, with you needing to remind yourself every time to give 100% focus on the ball and the shot. In order to make a strong save with good execution, you need to be focused on the ball. If you react at the last second, you can’t expect to be in a good chance of stopping the ball! When some goalkeepers will close their eyes or flinch at shots (which is a problem we can all face, not helped by poor equipment), you instead need to be confident in your kit and confident in that you will be able to make the save unharmed. When making any save, you want to be watching the ball ALL the way into your body – the specific piece of equipment making the save. 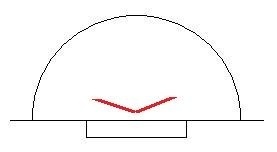 In each case the basic principal remains the same: by focusing on the ball’s complete flight, you stand a better chance of making the save than if you only caught sight of it at the last minute. 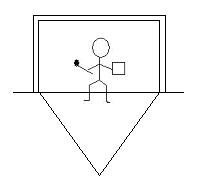 It terms of concentration and focus of elite goalkeepers, you can find photos of soccer goalies facing penalties where they are clearly following the path of the shot even if they have been beaten. Remember, it’s fairly simply; the more you focus, the more chance you have of making the save, so do your best to give it a hundred per cent. 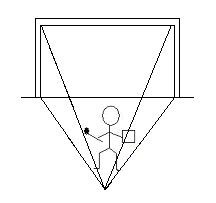 Research and sports science studies has shown that the more a goalie focuses on the object coming at them (depending on the sport played! ), the more they save. In ice hockey, the concept of the ‘quiet eye’ has been developed. It has been scientifically proven, that the more focus the goalie puts on the puck, the better chance they have of saving it. This link between eye contact and reaction is important to realising the need for total focus on the ball when goalkeeping in hockey. Watching professional soccer (football), you will often see the goalkeepers raising their hands up against a shot that goes wide. This asserts that they have been paying attention and know the ball is not going to end up in the net! When Vogels was playing (he is obviously retired now), he used to put his hands up when the ball had gone off, to show to the umpire and team that the play was dead and the ball had gone off. Similarly, you can show that you are certain the ball is wide of the goal or going over (by knowing your angles), by raising your gloves. If you feel it helps, calling “Wide!” will also help your defence know you are leaving the shot. It takes a bit of experience and practise though! The glove save sounds the most obvious form of save involving eye contact, with the goalkeeper watching the raised ball from shot to finished save, moving the glove into touch to block the incoming ball. However, you still need to be focused on the saving process and the ball, maintaining it throughout the saving motion in order to execute technique properly and help focus on the redirection for rebound control. 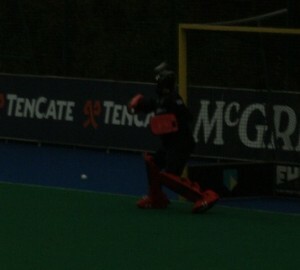 Stick saves are a little trickier due to the width of the stick and the reduced stopping surface that the stick offers. Nevertheless, it is important that you read the shot off the shooter’s stick and move the stick in to contact with the ball as required. Using your RHP to block the shot, rather than relying on the stick (if ), gives you a better chance of making saves to your right given the larger surface area the new styles of right hand protectors provide. Turning at the wrist and pushing into the save, your focus remains the same: making prolonged eye contact with the ball into contact with your rhp. The pad save may not seem like an area needing a write up on, but eye contact with the incoming ball will allow you to concentrate on the initial save along with the following rebound. 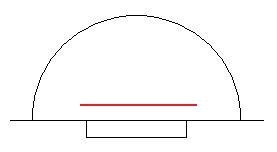 As the shot comes in you will obviously be lowering your view to the ground, following the shot low into your pad. In order to make a well executed stop with your kicker, you need to watch the ball into your foot; looking down to the pitch, to focus on being able to react appropriately, just like a pad save. When kicking clear, or making the save, the focus is the same: watching the connection with the foot to make sure the angle is correct and the clearance is sufficient. For the ball to be effectively cleared on the play, you need to be paying attention to the angle of the incoming ball and then set up the redirect to match. Though it’s not always orthodox or best (though I have seen it being taught by Dutch coaches and is good for blocking against deflections and killing rebounds), body saves still need your focus (and trust in your kit!). If you are forced into blocking the ball, you need to be aware of where the rebound goes in order to respond with your repositioning or clearance, forcing you to make eye contact with the ball. When diving, the concept remains the same, and watching the ball all the way into the save betters your chances of making the save, as well as getting a look at the incoming ball, for a well placed redirect to steer the ball to safety. Diving into the save puts the focus on the stick and rhp or glove; changing your focus to a lowered state to watch the ball into the save. When jumping, or high diving to reach the ball, your focus translates to the ball’s position, with your eyes ready watching the distance between you and its destination, so you are set to make the save with your equipment as you get closer to the ball through the jumping motion. With the ball away from you from the beginning, you need to watch with great awareness; judging the distance of the ball as you move in to block it. Sometimes you will be faced with situations where your view is impinged and you may struggle to see the ball. Here, the need is to locate the ball holder and react to the situation as it develops. This obviously makes life difficult. Whilst you may not get the chance to be totally focused, you can still prioritise your focus to react on the instant you catch sight of it, making sure you made the effort to focus on the incoming shot. Short corners are a time when you see goalkeepers losing their focus on the ball, even at the elite level. Instead of watching the ball from the injection to the flick or shooter, they simply choose to react to the corner as the play unfolds. However, I feel that short corners are an important time for goalkeepers to be focused on the ball because of the score rate of corners. 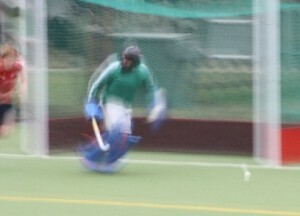 Focusing on the ball at the injection right through to the drag flick or shot will help provide you with a good focus for making the eventual save, as well as helping you to track the ball to the shooter (if there are multiple ‘castles’ or dummies) or slip pass for a routinely planned redirect. 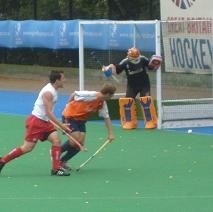 Penalty flicks are another time when it is important to have good focus on the ball. Players can easily wrong foot you and send you the wrong way with a dummy or using their eyes to pretend to be going one way (and go the other!) as you play against better quality opposition. Instead, make sure you focus on the ball and nothing else; going the right way as it comes at you in order to stand the best chance of making the save. Ultimately, the most important thing to remember is the need for focus when faced with making the save. The more you focus, the more likely you are to stop everything! In training and practise try and set your targets on focusing on every shot without fail; the more you force yourself to focus totally on the ball for the shot, the better goalkeeper you will be. Author Dan PilgrimPosted on September 22, 2012 September 22, 2012 Categories The BasicsLeave a comment on Focus on the ball! It is good to pinpoint the qualities of a top class goalkeeper, so that you know what you’ve got to work towards if you want to be the best. Aside from hard work and perseverance, it takes a special athlete to make it at the top. There are number of skills, some of which are natural and gifts we are born with (like amazing reaction speeds/reflexes), but it is possible to work hard to improve them, if you want to reach the top. Coaches look for these abilities, and this is important to remember if you want to be scouted to play at the best levels. To be able to make those highlight reel saves, you need to be athletic. 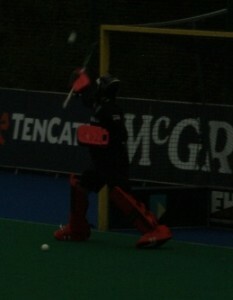 Although field hockey goalkeepers have all that extra padding, they need to be quick on their feet and acrobatic in save making. 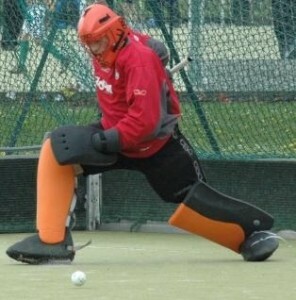 Just like soccer goalkeepers who leave their feet a lot, field hockey goalies need to be prepared to jump, leap and dive around to make the save, especially against tricky shooters with hard, well placed shots or quick drag flicks. Elite goalkeepers are aware of what players are going to do, which helps them make up their mind on when and how to make the save. Athleticism helps them to get into place to stop the ball, but it is their ability to read the game that makes the save. By being able to work out what will happen, they are also able to make better decisions as a result; one step ahead in the battle against the opposition. 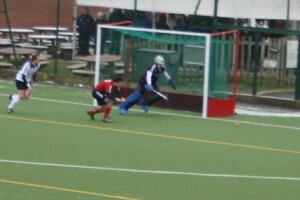 At the top level, goalkeepers often have to make consecutive saves if the shot is uncontrollable (unable to direct the rebound given the power of the shot). To be able to do so, the goalkeeper needs to be agile; getting up immediately and recovering to stop the shot. With immediate changes in play, goalkeepers will also have to change direction. If you have to move from post to post to be attempt a save on a passed shot, then you need to be lightning fast to get there in time to block. This is what agility is all about. A strong mentality is so important to being an elite athlete; dealing with the pressures that come with the position. Goalkeepers are competitors and don’t ever like being beaten. If a goal is scored against them, it is immediately forgotten about and ignored, rather than being worried about and causing more goals. The goalkeeper needs to carry their team and help them win. Especially at the international stage, goalkeepers would underperform if they were nervous and showed it. A goalkeeper has to be a fighter. If the chips are down and they are up against it, the goalkeeper shows no sign of giving up. If the game is already lost and there is no chance of evening the score, the goalkeeper will still pull off the saves to keep the game alive. This is so important in close games when the score is tied, or down a single goal, because it shows the team that the goalkeeper doesn’t give up and will help the team to make a comeback. Goalkeepers have to be elite decision makers: they need to know when to do the right thing and do it properly at the right time. Things such as whether to come out and block slide on a 1-on-1, aggressively, or play the shot and make the save. The goalkeeper has to be able to read the play and make the correct decision. Working with the defence is crucial; if they have their support then it makes it easier to play passively, but if the defence cannot get back in time, then the goalkeeper needs to take charge. It is also about making the right save selection; prioritising the rebound placement so there are no second chances. 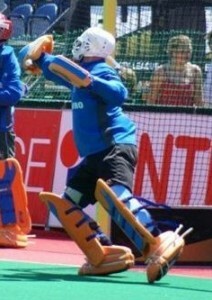 Reflexes are another obvious part of elite goalkeeping. Good reflexes are an essential part of goalkeeping and are even more important at the top level of the game. It is not a skill, which you can learn (although you can improve it), so elite goalkeepers are normally naturally gifted with good reactions. 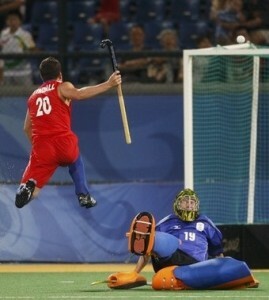 To be able to stop a shot from a guy with a stinging shot like Jamie Dwyer, you need to have lightning fast reactions. Obviously goalkeepers need to have good technique and a good skill set, otherwise they will give away easy goals through bad posture, save choice, or simply not being on angle. A technical game is important: without it, can you cannot succeed at the highest level because the opposition will easily pick apart your game. The ability to control rebounds, make difficult saves look easy etc. is all part of this. Coaching helps this; knowing what to do in a certain situation, and putting it into practise makes your job easier. Some goalkeepers get a head start in their careers because of having coaching from a young age, but it is still possible to progress with out it and then get coaching after being recognised. Game experience is vital. The more game experience the better; the best goalkeepers are those that are experienced, so elite goalkeepers should have bags of it (i.e. they will obviously have been playing since childhood, but will also have experience playing at high levels or junior international games!). A goalkeeper who has played lots of games can call upon these experiences when faced with an all-important, difficult matches; helping them make the right choices or stay calm when it gets tough. Experience helps the goalkeeper with the ability to read the play and know what is going to happen. Game experience is invaluable and it is better to be experienced than rely on skill. Great goalkeepers are often aggressive; taking charge of situations and dominating their area. Goalkeepers need to be aggressive; they need to dominate their D and shut down plays if needs be. You cannot always be passive or too reliant on your defence, such as needing to intercept passes that will prevent scoring chances. Obviously being too aggressive is a danger, but the ability to challenge the attacker and make their life difficult is essential if you want to go far. A great goalkeeper is like a choir master, in charge of the orchestra; they are the one who instructs their team on what to do. The goalkeeper has the best view on the pitch and they should use that to their team’s advantage. Providing constant communication to their defenders will help the team make the right decision in how to deal with a player. Defenders want to know what to do and elite goalkeepers will be able to tell them. Goalkeepers have to be brave and confident. If you are to reach the best level of the game, then you need to be unafraid of the ball. When you train and play with top level shooters, shots come at you hard and fast, and there is no time to get scared or flinch. An elite goalie is not afraid of the ball; they are better than it and control it, hard shots don’t bother them. 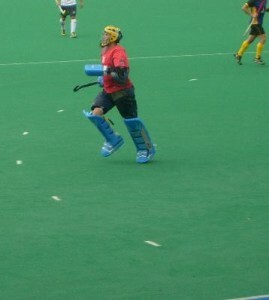 A goalkeeper shouldn’t be afraid of hard shots, instead they should believe they are like tennis balls – easy to stop! 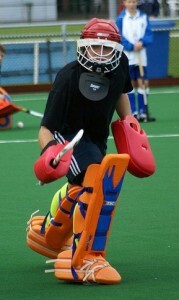 Great goalkeepers also have strong concentration levels, able to quick ‘switch on’ when it is important to do so. Not content to ‘nod off’, they are aware of what is going on in front of them, taking part in the game and organising their defence vocally. Without this ability, they could be caught off guard and easily concede a goal. Author Dan PilgrimPosted on July 31, 2012 August 7, 2012 Categories The Basics3 Comments on What makes a great goalkeeper?